A powerful company develops a promising new blockbuster. The more diseases and conditions the drug can get approved for, the greater the sales. Therefore the company launches trials for many different indications, as its clinical research programme unfolds. Independent committees set interim analysis and appropriate stopping rules for these trials, to avoid harming people on placebo for too long if the drug proves effective. Then, some trials start showing statistically significant benefits, so they are stopped early and the drug gets approved for those indications. Suppose all findings and all results are reported—that is, no reporting bias1 operates. This sounds like the ideal success of honest drug development and clinical investigation. However, it can be shown that the drug is less effective than these trials suggest—and sometimes not effective at all. Why? Two reasons explain this paradox. Firstly, the drug is tested for many indications and secondly, the first trials have been stopped early. The first reason refers to the breadth of the evidence. The second refers to the timing and depth of the evidence. That does not mean that when a drug is proved effective in an early stopped trial it is completely ineffective. However, if it is only half as effective as we thought its benefit-risk ratio and cost-effectiveness may not justify its use or they may justify it in far fewer patients than we thought. The solution to this problem is to examine the whole clinical research programme for any new intervention. Systematic reviews and meta-analyses have traditionally focused on one intervention at a time. Moreover, they depend on published data, or, at the most, they try to unearth data from completed but unpublished trials. Systematic reviewers should be aware of the breadth, timing, and depth of all the evidence on the drug they are reviewing. They should take into account the extent of diversity in the research programme, use caution with early stopped trials, and consider the depth of the total evidence for each indication. The total evidence includes published trials; completed (and analysed) but unpublished trials; and continuing trials. Obviously, analysed outcome data can be obtained only for completed analysed trials. But it is important to know whether the data in the meta-analysis calculations represent all, most, or only a small portion of the full programme and whether the available data suffer from early stopping. We show here two examples to illustrate our points. The first example shows the importance of considering the breadth and depth of the evidence for anti-tumor necrosis factor (anti-TNF) agents, a class of expensive drugs tested for a large number of indications. The second example shows the importance of considering also the timing of the evidence for one of the most expensive cancer drugs, bevacizumab. We searched MEDLINE and ClinicalTrials.gov (April 2010, search details available from authors) for randomised trials evaluating any selective anti-TNF agent against placebo or another active treatment in patients with immune mediated inflammatory diseases. In ClinicalTrials.gov (see appendix 2 on bmj.com) we identified 54 completed published trials (20 942 patients), 41 (9984 patients) completed unpublished trials, 32 (11 465 patients) ongoing closed trials (9 of these have already published some results), and 43 open recruiting trials (expected enrollment 10 809 patients). There are also 6 registered not yet open trials (expected enrollment 794 patients), 10 terminated trials (847 patient; 1 trial has been published), and 2 suspended trials (1078 patients). Among the 188 trials, only 5 compared head to head different anti-TNF agents (none published yet), and another 32 trials compared an anti-TNF agent with one or more active comparators (only 4 published to-date). All other trials have been comparisons against placebo or no treatment. Overall, the published trials represent only 34% of the total evidence (46% if we exclude the open trials). The percentage of published trials varies for each drug-intervention pair (see appendix 3 on bmj.com). With six agents and seven indications there are 42 drug-indication pairs; trials are available for 28 of them and licensing approval has been granted for 22 drug-indication pairs. For six of these 22 less than half of the registered trials’ evidence is published and for several others the data are also limited (see table⇓). Inferences about the exact treatment effects of these agents require extra caution. We found 34 systematic reviews and meta-analyses of trials evaluating the effectiveness of anti-TNF agents in immune mediated diseases (see appendix 4 on bmj.com; PubMed, April 2010). Of those, 12 deal with a single agent and single indication; 22 deal with several agents for a single indication. None considered several indications. Bevacizumab is the first extensively studied anti-angiogenesis monoclonal antibody. It is expensive, with annual sales of $2.7bn (£1.8bn, €2bn).11 A search in ClinicalTrials.gov returns an amazing number of 1093 registered studies, the vast majority (922) in cancer. Bevacizumab is being tested in nearly all types of malignancy. Bevacizumab was first approved for use in metastatic colorectal cancer (Food and Drug Administration 2004, European Medicines Agency 2005) based on the results of the E3200 trial, which was stopped very early because of a major survival benefit (hazard ratio 0.66, 95% confidence interval, 0.54 to 0.81). In 2006 it was approved for lung cancer, based on another early stopped trial with significant survival benefit (HR 0.79, 0.67 to 0.92). In 2007 it was approved by the EMA for metastatic renal cancer, based on the results of another trial also stopped early because of benefit in disease progression (prolonged disease remission). Other approvals followed for breast cancer in 2007-8 and glioblastoma in 2009. The FDA approval for breast cancer was given against the recommendations of outside experts, who cautioned that no survival benefit had been documented. The approval for glioblastoma was given without data from phase III randomised trials. Then, in mid-2009, results from the largest trial of bevacizumab were presented at the American Society of Clinical Oncology meeting. Among 2710 randomised patients with colorectal cancer, bevacizumab improved neither survival nor disease free survival. Actually, a benefit was seen in the first year with a hazard ratio of 0.60 (as in the early stopped trial that had led to the initial enthusiasm), but it was transient and totally reversed with longer follow up. In Clinicaltrials.gov (March 2010) there are 26 closed phase III cancer trials of bevacizumab v placebo (see appendix 5 on bmj.com). Of those, 9 trials (7234 patients) have been completed and published, 3 trials (4669 patients) have had survival results reported at meetings, and 14 trials (10 724 patients) have not reported survival results yet. Based on closed phase III trials, the published evidence plus that reported at meetings represents 83%, 57%, 74%, and 62% of the data for renal, breast, lung, and colorectal cancer data respectively, while survival data on ovarian, prostate, gastric, and gastrointestinal stromal tumours are still pending (March 2010). Figure 1⇓ shows a forest plot of the 12 studies with available data on survival (14 comparisons). The summary hazard ratio is 0.87 with 95% confidence interval of 0.82 to 0.91. Testing for between-study heterogeneity gives P=0.14 (Q=18.95, 13 df and I2=31%), suggesting modest heterogeneity. However, it is obvious that the three first trials that were stopped early had larger effect sizes. The summary hazard ratio for the other 9 trials (11 comparisons) is only 0.90 (95% confidence interval 0.85 to 0.95), and results are very consistent across these trials (Q=8.63, 10 df, p=0.6, I2=0%). When the early stopped trials are excluded, the summary effects for survival for each type of cancer are also consistent between themselves (Q=3.84, 4 df, p=0.3, I2=0%). Fig 1 Meta-analysis forest plot for survival with bevacizumab v control in trials of patients with cancer. Each trial is shown by its year of publication, name of first author, and type of malignancy as well as the hazard ratio for survival and 95% confidence interval. Also shown are summary estimates including all trials and excluding the three trials stopped early, which showed large treatment benefits (Hurwitz 2004, Sandler 2006, Escudier 2007). Even though no heterogeneity is detected when the trials that were stopped early are excluded, some modest heterogeneity may be missed because of the limited power of heterogeneity tests.12 Even with this caveat, the emerging evidence suggests that bevacizumab confers a survival benefit in patients with cancer that is small on average (10% relative risk reduction) and is unlikely to be large for any specific tumour type. Guideline developers, drug approval agencies, and insurance companies may debate on whether this evidence is sufficient for endorsing this drug. Such a debate should consider also cost, and other outcomes, both of effectiveness, such as disease free progression, and harms, such as hypertension, perforation, haemorrhage, proteinuria, and wound complications, all of which are increased with bevacizumab. Even if the large benefits from early stopped trials are assumed to be realistic, bevacizumab was barely cost effective in cost utility analyses.13 With much smaller benefits and better documented harms,14 15 16 its prospects are more bleak. 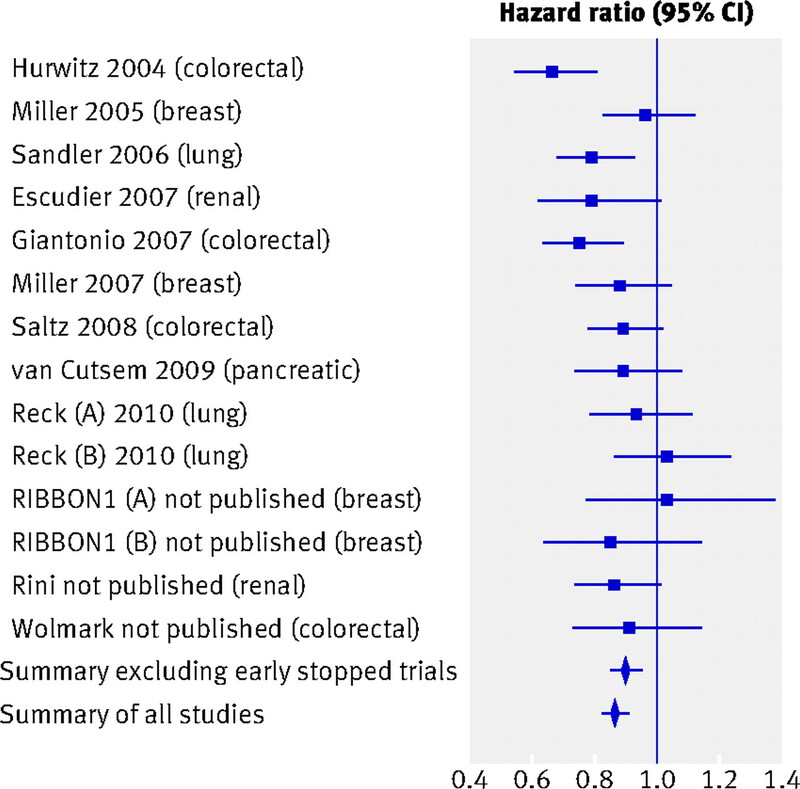 Between June 2009 and March 2010 six meta-analyses of bevacizumab effectiveness for cancer have been published (PubMed search, March 2010; see appendix 6 on bmj.com). All of those deal with a single type of cancer and each considered only one to three phase III trials (up to five trials maximum when they include also smaller phase I/II trials). None of these meta-analyses took into consideration the whole range of bevacizumab trials in cancer or even a modest fraction of it. In appraising the evidence for new interventions, systematic reviewers should be aware of the breadth, timing, and depth of the wider programme of clinical trials. This includes the diversity of different tested indications, early stopping of trials, and the amount of data in unpublished and ongoing trials. Meta-analyses that ignore this wider agenda could reach narrow, misleading interpretations. Evaluation of the wider agenda requires comprehensive trial registries.18 19 In specialties where trial registration is still rudimentary or non-existent, systematic reviews should be extremely cautious. Sponsors may launch a vast but only partly registered programme of trials. Registration may be eclectic depending on whether national or international agencies require registration. Some drugs may get approved in some countries but not others. For example, antidepressants such as mianserin, milnacipam, and fluoxamine are not approved in the US, but they are approved in other countries where their trials did better.20 Fragmentation of the programme increases the multiplicity problem. Superimposed selective reporting of analyses and outcomes1 2 3 can make anything seem effective. When a trial is stopped early for effectiveness, this simply means that the treatment effect is not null. However, the effect may be small, much smaller than initially observed. With a small treatment effect the intervention may not have a favourable risk-benefit or cost-utility ratio. Early stopping should be performed sparingly and judiciously, and results from single, early stopped trials are unreliable.4 5 6 Furthermore, even when several trials have published their results, it is useful to know how many more have not. Formal approaches can investigate how a meta-analysis of published results would be affected from simulated results of additional trials.21 Knowing that much of the evidence is still missing should lead to caution. In summary therefore, although systematic reviewers should ask precise questions, they also need to have a clear view of where each question sits in relation to other questions being asked. A narrow meta-analysis of a single type of comparison for a single indication may miss most of the interesting story about an intervention and its agenda. Decision making can seldom be based on a single systematic review. These issues may have also implications for drug licensing. The licensing process should consider the status of the wider agenda in making appropriate decisions about new agents. Contributors: JPAI had the original idea and both authors developed the concept; both authors collected and analyzed data; JPAI wrote the paper and FBK critically reviewed it. Both authors approved the final version. JPAI is guarantor. Competing Interests: All authors have completed the Unified Competing Interest form at www.icmje.org/coi_disclosure.pdf (available on request from the corresponding author) and declare that (1) both authors had no support from a third party for the submitted work; (2) both authors have no relationships with companies that might have an interest in the submitted work in the previous 3 years; (3) their spouses, partners, or children have no financial relationships that may be relevant to the submitted work; and (4) both authors have no non-financial interests that may be relevant to the submitted work. Access to data: JPAI had full access to all of the data in the study and can take responsibility for the integrity of the data and the accuracy of the data analysis. Bassler D, Briel M, Montori VM, Lane M, Glasziou P, Zhou Q, et al. STOPIT-2 Study Group. Stopping randomized trials early for benefit and estimation of treatment effects: systematic review and meta-regression analysis. JAMA2010;303:1180-7. Hughes MD, Pocock SJ. Stopping rules and estimation problems in clinical trials. Stat Med1988;7:1231-1242. Ioannidis JP. Why most discovered true associations are inflated. Epidemiology2008;19:640-648. Ioannidis JP. Effect of the statistical significance of results on the time to completion and publication of randomized efficacy trials. JAMA1998;279:281-286. Sfikakis PP. The first decade of biologic TNF antagonists in clinical practice: lessons learned, unresolved issues and future directions. Curr Dir Autoimmun2010;11:180-210. Barra L, Pope JE, Payne M. Real-world anti-tumor necrosis factor treatment in rheumatoid arthritis, psoriatic arthritis, and ankylosing spondylitis: cost-effectiveness based on number needed to treat to improve health assessment questionnaire. J Rheumatol2009;36:1421-8. Huedo-Medina TB, Sánchez-Meca J, Marín-Martínez F, Botella J. Assessing heterogeneity in meta-analysis: Q statistic or I2 index? Psychol Methods2006;11:193-206. Tappenden P, Jones R, Paisley S, Carroll C. The cost-effectiveness of bevacizumab in the first-line treatment of metastatic colorectal cancer in England and Wales. Eur J Cancer2007;43:2487-94. Hapani S, Chu D, Wu S. Risk of gastrointestinal perforation in patients with cancer treated with bevacizumab: a meta-analysis. Lancet Oncol2009;10:559-68. Rennie D. Trial registration: a great idea switches from ignored to irresistible. JAMA2004;292:1359-62. Laine C, Horton R, DeAngelis CD, Drazen JM, Frizelle FA, Godlee F, et al. Clinical trial registration: looking back and moving ahead. Lancet2007;369:1909-11. Ioannidis JP. Effectiveness of antidepressants: an evidence myth constructed from a thousand randomized trials? Philos Ethics Humanit Med2008; 27 May:3:14. Sutton AJ, Cooper NJ, Jones DR. Evidence synthesis as the key to more coherent and efficient research. BMC Med Res Methodol2009;9:29. Salanti G, Kavvoura FK, Ioannidis JP. Exploring the geometry of treatment networks. Ann Intern Med2008;148:544-53. Dias S, Welton NJ, Caldwell DM, Ades AE. Checking consistency in mixed treatment comparison meta-analysis. Stat Med2010;29:932-44. Lathyris DN, Patsopoulos NA, Salanti G, Ioannidis JP. Industry sponsorship and selection of comparators in randomized clinical trials. Eur J Clin Invest2010;40:172-82.